In order to continuously improve the transparency of power distribution grids, it is important to have precise knowledge about the relevant conditions in the local grid. This is achieved by utilising every available source connected to the system. Siemens offers a comprehensive portfolio of grid monitoring functions for this purpose, comprising solutions for measuring, recording and reporting the information needed from the distribution grid. This information can aid grid operators in their efforts to determine, adjust and improve grid quality. Siemens has now rounded out its range of products for monitoring power distribution grids by introducing the short-circuit and ground-fault detection device Sicam FSI (Fault Sensor Indicator). While the digital short-circuit monitoring devices Sicam FCM (Feeder Condition Monitors) and Sicam FPI (Fault Passage Indicators) are deployed in cable networks, this new system reports short circuits and ground faults in the medium-voltage overhead line grid. 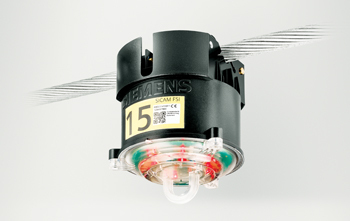 Siemens developed the device for quickly locating and reporting faults in the overhead line grid and designed it to be installed directly on the overhead line. Precise determination of fault location and quick notification of the maintenance teams considerably reduce outage times. Because locating faults can be so time-intensive and therefore costly, the system also reduces personnel costs for grid operators. Sicam FSI measures and records the momentary line current and voltage values for the purpose of identifying short circuits and ground faults in the medium-voltage overhead line grid. From this information, the device derives minimum, maximum and mean values to enable display of faults based on identified overcurrents and undervoltages. The Sicam FSI can be identified by way of a Quick Response (QR) code on the device, and configured via a web browser instead of dual in-line package (DIP) switches. The set trigger values are infinitely variable. Siemens supplies the short-circuit monitoring system in two versions: with local visual displays (LED) and with additional communication capabilities. The device establishes communication with the upstream Sicam Fault Collector Gateway (FCG) mounted at the foot of the pylon via an encrypted and secure radio link. In both versions, red LEDs illuminate in the event of a fault. Differing flash frequencies, depending on the fault type and cause, enable precise fault diagnostics. However, with the version not equipped with supplementary communications link, faults have to be localised within the monitored grid section by local inspection patrols. With the system version equipped with communications link, the fault data are transmitted in encrypted form to the associated Sicam FCG and forwarded by secure connection based on the General Packet Radio Service (GPRS) standard via IEC 60870-5-104 telecontrol protocol to the superordinate grid control station. A battery in the control box, charged by photovoltaic modules, supplies the device with operating voltage. Grid section inspection patrols are no longer necessary thanks to the radio link to the grid control centre. The grid operator installs three Sicam FSI devices for each three-phase cable system. In an alarm/reporting system fitted with radio link, a Sicam FCG communication device can receive and forward the data from a maximum of nine Sicam FSI short-circuit monitoring devices. The distance between the monitoring device and communication device must be no more than one hundred meters at maximum. Sicam FSI functions maintenance-free with a battery life of ten years.